This had me scratching my head a year ago when my friend posed a question. It started a research session, and another, and another. It would seem there haven't been a whole lot of studies done on itchy scalp (otherwise known as pruritus). Nope, sorry. That's a complete and utter exaggeration. The fact is – in the entire world of scientific examination and study – there isn't a single study to be found on itchy scalp. I'll bet you're itching to know where we go from here, aren't you? (sorry, I just had to throw that in). So, where does one go for information and help if they are experiencing itchy scalp from hair dye? I heard you think 'stop dyeing the hair', but let's – for a moment – pretend that isn't an option. I asked a few hairdressers how they tackled the situation if a customer complained of itchiness from hair dye. Several of them gave me the same answer. It would seem the nearest sugar bowl (or artificial sweetener bowl, if you will) contains a packet of itchy scalp relief. 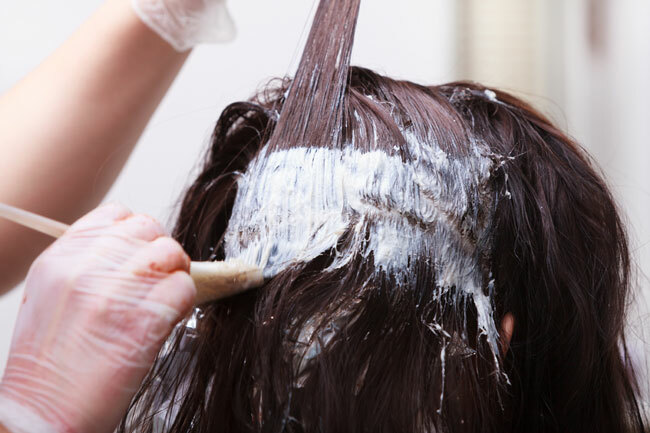 The artificial sweetener known as Sweet and Low is the favorite product for hair-dye-scalp-itchiness amongst American hairdressers. Let's have a closer look at how it is possible for an artificial sweetener to help relieve itchiness on a scalp coated with hair dye. With permanent hair dye, it is possible to transform any natural hair color into the desired flaming red, deep black, chestnut brown, or platinum blonde shade – and it stays there until new hair grows out. But to understand what causes itchiness from hair dye in the first place, we need to take a super-brief look at the chemical make-up of permanent hair dye (I promise it won't be too nerdy). Permanent color hair dye consists of two main components: ammonia and hydrogen peroxide. It is the ammonia's job to damage the hair cuticle enough to where the new color can penetrate. Yes, you read correctly – damage the hair cuticle. The pH of ammonia is 11.6. It is the hydrogen peroxide's job to 'develop' the color. Peroxide has a pH of 6.2. If this sounds like a harsh chemical combo that isn't very hair or skin friendly, then you are quite right. This alkaline solution can indeed be quite the irritant. In general, a permanent color hair dye has a pH of about 11. Some hair dyes contain paraphenylenediamine (also known as PPD). This is a popular hair dye ingredient because it provides a natural looking result. Unfortunately, PPD is also harsh enough to warrant cautions, require strict rules, and even be banned for some uses. For example, it is illegal to use PPD on the skin in most western countries (it is used in henna tattoo products). Used directly on the skin, PPD risks causing severe allergic reactions that may even result in lifelong sensitivity to perfumes, printers inks, dyes, and even sunscreens. PPD is allowed in hair dyes – but only at a maximum dosage of 6%. Looking at the components of permanent hair dye certainly gives an indication that scalp itchiness, irritation, and sensitivity is practically a given. It's no wonder some people have reactions from dyeing their hair. And it's no wonder folks have been trying to find a solution. Hairdressers battling hair dye itchiness have been doing so successfully by adding artificial sweetener directly into the hair dye mixture. 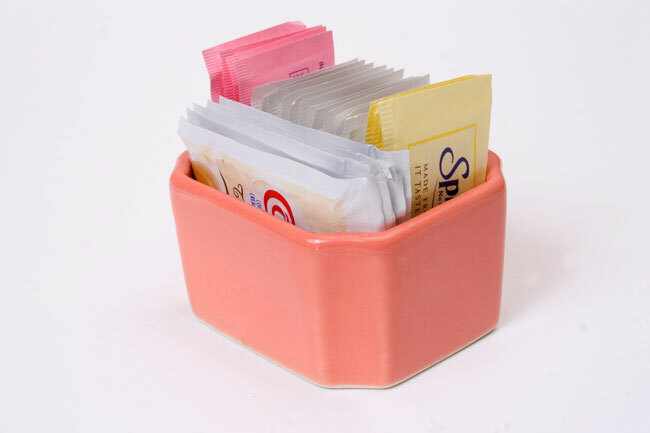 The most popular sweetener is available in a little pink packet labelled Sweet and Low. I'd love to know who came up with this idea, but so far, no one seems to be taking credit. If you're in Canada – where saccharin is not allowed in food products – your Sweet and Low is made with sodium cyclamate, dextrose and cream of tatar. As Sodium cyclamate has a higher pH, I can't help wondering if Canadian Sweet and Low would provide the same relief the US version of this product. Since there have been no studies - either on scalp itchiness or on relief-of-scalp-itchiness-caused-by-hair-dye, there can only be theories and speculations as to how and why these ingredients are providing help. My theory: Considering how alkaline a hair dye solution is to begin with, it seems logical to me that lowering the pH is going to provide itch-relief. The addition of these artificial sweeteners is helping to neutralize the ammonia, resulting in a more scalp-friendly solution. But then, that's just my theory. If you have another, please feel free to drop a comment below. That the simple addition of these ingredients doesn't seem to be interfering with the quality or function of the hair dye makes me wonder why the heck the hair dye manufacturers haven't been providing more scalp-friendly products to begin with. If it's really that easy to make the solution less irritating without sacrificing function, the manufacturers should be reformulating their products! I cannot say from personal experience if adding Sweet and Low to hair dye stops itchiness. I can, however, relate my friends account. She regularly went through scalp-itching torture having her roots done until she discovered this solution. She told me the artificial sweetener made 'all the difference in the world'. It was she who asked if I could explain why adding artificial sweetener to hair dye works for itchiness. Do you know if adding this sweetener will affect to colouring results? I was wondering it might if you are changing ph levels? And no you have any advise what might help itchiness if you are not dyeing your hair with commercial hair colours? I've a very itchy scalp, that is better when I started to use my own shampoo bars and stopped dyeing my hair, but it is still itchy. I use Sweet and Lo in haircoloring. Even though there is really no substantial proof, but people say it acts like and anti-histamine. I add anywhere from 2 to 6 packets depending on the haircoloring and this could be any type from permanent to demi-permanent. I also have to say, with permanent and demi permanent haircolor, itchiness will occur because of the peroxide burns on the scalp. If you ever got haircoloring peroxide on your fingers, the burn is slight but annoying; I always sprayed vinegar to neutralize the burn. Hi Signe - As far as I understand, adding the sweeteners does not affect the quality of the colouring. As for battling itchiness on the scalp - Do you make your own products? If so, you might try a combination of these ingredients: lavender, panthenol, aloe vera, peppermint (in small amounts, peppermint can be quite soothing). Best of luck with it - and do let me know how it goes! Hi Jenn in GR - Yup, it is definitely something that had me wondering about as well. Again - there are no studies on this, but there does seem to be a consensus that it works. Hi Olivia - Wow - you've really had this issue up close and personal - this is some interesting input. I'm curious as to the vinegar spray - does this affect the hair colouring in any way? Hi, Lise! I actually don't use much more than my home-made shampoo bar and vinegar rinse anymore, and sometimes I dye with henna. But I'll try those in some form - in shampoo bars it will take long time before I can test them, but I'll try. Hi Anon - I'm sorry to hear you haven't had success with this. You are absolutely correct in that an allergy to PPD cannot be helped 'after the fact'. Hey there Y Schaefer - great to hear that this worked. Did the color come out as you expected as well? Hi Melinda - oh that's interesting! It would be interesting to investigate this in more detail. I've suffered from a severe PPD allergy for years. My hairdresser tried doing foil lowlights, but even the tiny bit of dye touching my scalp with foils made me break out in a horrible, itchy, welty massive reaction. A tiny drop of dye in my inner elbow (patch test) would cause a one-inch swollen, crusty welt that lasted a week. So I decided to go blonde because highlights and toner don't affect my skin at all, and I refuse to go grey. My hairdresser just heard about the Sweet and Low trick and tried it on me yesterday. I had her add lowlights back in (I really don't want to be blonde), and dang! No reaction. So I'm going to have her gradually try a bit more each time with Sweet and Low until I'm back to my normal color. This is amazing! Have anyone tried any other sweetener or something like a soda or citrus?? Soda has a lot of sweetener and has low pH. Please write if anyone has tried. In case this may help those who suffer in the same way. I suffered from a very itchy scalp for years. It was all the time with no relief. I eventually discovered, after starting to make all my own cosmetics including shampoo and conditioner, that it was down to the pH of the product. I now have an itch-free scalp for the first time in years due to making my own hair products with a pH between 4.5 and 5.5. I add citric acid at the end and check with my pH meter. I'm guessing one could add citric acid to bought products to lower the pH but don't quote me! Hey! Im in Canada and Sugar twin works! I could never leave hair dye in for as long as it should have been, due to burning and itching. I was so scared it was damaging my scalp. I added sugar twin (thanks internet)and voila! No more burning. I added 2 packets and was told that up to 3 will not cause a change in color. My hairdresser uses one packet of sweet and low in my hair color and it really cuts down on my itchy scalp. It truly works and it does not affect the final result at all. Hi Anon — Have you tried googling the ingredients for Sweet n Low? Hi Anon — saccharin, dextrose and cream of tartare are the main ingredients. If you can source some saccharin and dextrose you could do your own mix and give it a try. Alternatively— if you are looking to relieve itchy scalp after having dyed your hair you might find some relief from the rhassoul hair mask listed on the How To page on this blog. Best of luck with it! I am very allergic to hair dye. Unfortunately, sweet and low doesn't work for me. My scalp still was very red and itchy. I had to forgo the hair dye. The itch was too severe. Hey there Anon - Thanks for sharing this. I do believe you are the first person to comment that this doesn't work for you. I hope you find a solution! Is it only Sweet and Low that will work (saccharin)? What about Equal or Splenda, which use aspartame and stevia? Hi Alexandra - I’m pretty sure it is the exact composition of Sweet and Low that makes the magic. That said, you might give an alternative product a try and see how it goes. Best of luck! Hi Alexandra, I use Great Value, Walmart brand, made with sucralose in my hair dye & it works great! So my assumption would be to look for sucralose & you’ll be ok. By the way I’m totally gray & love using L’Oréal Smokey blue on my hair. Almost had to give it up because of the itching. Not now! And I love the shine & boldness of the color. The color lasts very well. Also adding a few drops , 6-10, lavender oil to your conditioner and leaving it on, after massaging it in, will feel great too. Rinse it out as normal. Hi unknown, I too have gray hair & love the L’Oréal smoky blue color. When I first used it I itched so bad I thought I’d have to stop. But one of the hair stylists told me to use sweet n low. I also used great value’s brand & am proud to say it works just like they say & I save money by using the store brand. Hi Path - thanks for sharing! Oh and as far as the color it stays just as beautiful as it should. The shine is brilliant and I still get the same amount of time between coloring.